Chanteur Rockabilly US, né le 12 Juin 1953 à Memphis (Tennessee). Rocky Burnette est le fils de Johnny Burnette. The son of legendary rock & roll pioneer Johnny Burnette, Rocky Burnette followed in his father's musical footsteps, playing rowdy, high-energy rockabilly that dovetailed nicely with the early-'80s revival of the style. 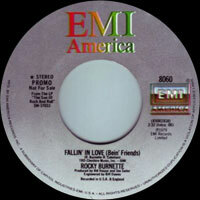 Born in Memphis in 1953, Burnette debuted in 1979 with the EMI America album Son of Rock'n'Roll (around the same time his cousin Billy began recording straight country for Columbia). 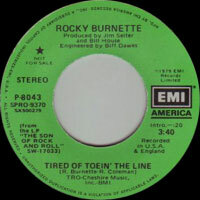 The following summer, his single "Tired of Toein' the Line" became a Top Ten smash, predating success stories by the likes of the Stray Cats and the Cramps; the song was also quite popular internationally, establishing an overseas fan base for Burnette that would endure for quite some time. 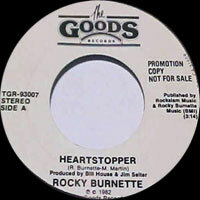 However, EMI America's financial difficulties scuttled promotion efforts for the follow-up singles (several of which became hits in other countries), and Burnette's second album, Heart Stopper, got lost in the shuffle. 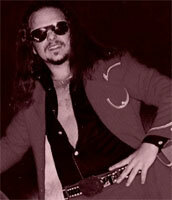 In 1981, Burnette toured Europe with the final version of his late father's Rock & Roll Trio; Burnette also used the band on his next album, Get Hot or Go Home!, which was issued on Enigma. Unfortunately, it met with little commercial response and Enigma chose to drop Burnette and the Trio rather than release their more country flavored follow-up. Burnette began to resurface in the mid-'90s, working with Rosie Flores and Dwight Twilley, and also contributing Vocalss and the original "Trouble Is I'm in Love With You" to ex-Trio guitarist Paul Burlison's 1997 solo album Train Kept A-Rollin'. In 1996, Burnette finally issued another album, Tear It Up; unfortunately, the label, Core, went bankrupt almost immediately after its release. Undaunted, Burnette kept up his international tours, and supplied soulster Percy Sledge with a European hit with "You Got Away With Love" in 1997. 1982 SP GOODS TGR-93007 (US) . Heartstopper / ?